Feng Shui release date was Friday, October 5, 2018. This was a Limited in theaters release. One's ancestors' tomb spot could change one's destiny. 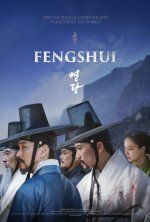 Jae-Sang (Cho Seung-Woo), a prodigal geomancer, loses his family while trying to stop the Kim family from conquering Korea by getting their hands on all the propitious tomb spots. 13 years later, Heung-Sun from a fallen royal family comes to Jae-Sang and suggests ousting the Kim family from power. The two men decide to work together, but they soon reach conflict when they learn of a tomb spot that would produce two kings in a family.